Vitebsk streets are a mixture ofancient and modern. The city has many old buildings. Old streets running down from the hills, which are the foundation of the city. In Vitebsk, there is a hundred streets, alleys and avenues. Their total length is 325 km. The length of over 3 km have only 7 streets. Central Lenin Street is the mainhighway. It has all the hallmarks of the city's main artery. 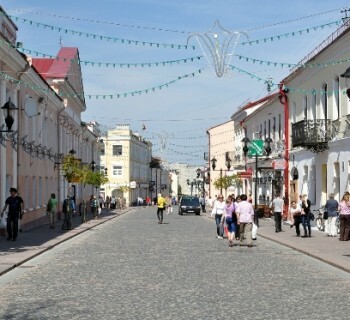 It is well appointed and spacious street, crossing town of Smolensk market to Victory Square. In this place there are many restaurants, shops, boutiques and cafes. Lenin Street was renamed several times. The oldest portion of it was formed in the 14th century, and the youngest - in the 19th century. In the central part of the old town is locateda small but very picturesque street Pushkin. It was updated in 2011, when the pavement covered with tiles of granite installed fountains. Now the street is pedestrian. In the historic part of Vitebsk passes Tolstoy Street. 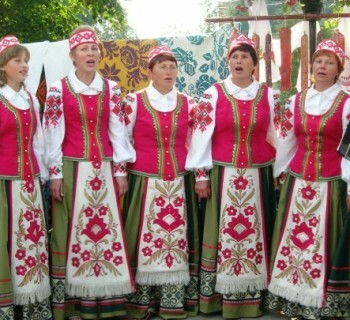 It begins near the street Suvorova and continues until Resurrection Square. street length - 200 m.
World Heritage city is considered to be a beautiful areaVictory. Her rank as the largest European Square. This area has a unique architectural style and interesting scenery. The unprecedented scale and beauty made her the center of the city and the venue for cultural events. Decoration of the square is a memorial to the "Three bayonets." Face is considered Vitebsk Railway Station Square, rebuilt in 1866. It is decorated with a fountain with lighting, beautiful lawns and flower beds. Old street in the city is considered the castle, located on the border of the October Railway and district. Buildings in this place formed in the 11th century. Vitebsk streets differ diverse architecture. In the main list includes Yanka Kupala Street, where there are beautiful mansions, rebuilt in the 19th century. former apartment houses and mansions. Interesting architectural structures are on the street Polytechnique, whose length is not more than 120 m. The houses, located on it, refer to the end of the 18th century.